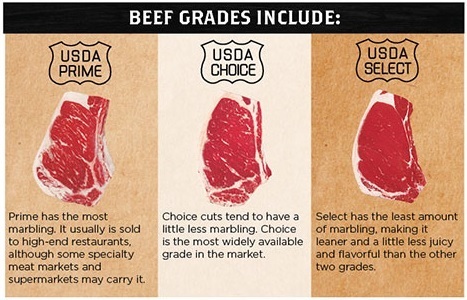 Have you ever wondered what the different grades of beef mean? Should you buy Prime, Choice, or Select? Here is a little research we did on grades of meat! The U.S. Department of Agriculture (USDA) determines the grade of beef based on the Quality and Yield of the beef. The tenderness, flavor and juiciness determine the quality. The amount of usable meat dictates the yield. The three most common grades of beef are Prime, Choice, and Select. Each of these USDA symbols assure buyers that the product has been surveyed by licensed graders who follow a very strict criteria and protocol. Below we will discuss these, as well as a few other common grades of beef. USDA Prime – Steaks labeled USDA Prime are the highest quality of beef. This meat comes from young, well-fed cattle. The marbling (fat to lean meat ratio) is high, giving this cut the highest level of tenderness and flavor. Prime grade is most often served in high end restaurants. USDA Choice – USDA Choice beef accounts for 50% of all graded beef quality. It is less marbled than Prime beef, but still has a ratio that is conducive for great tenderness, juiciness, and flavor. 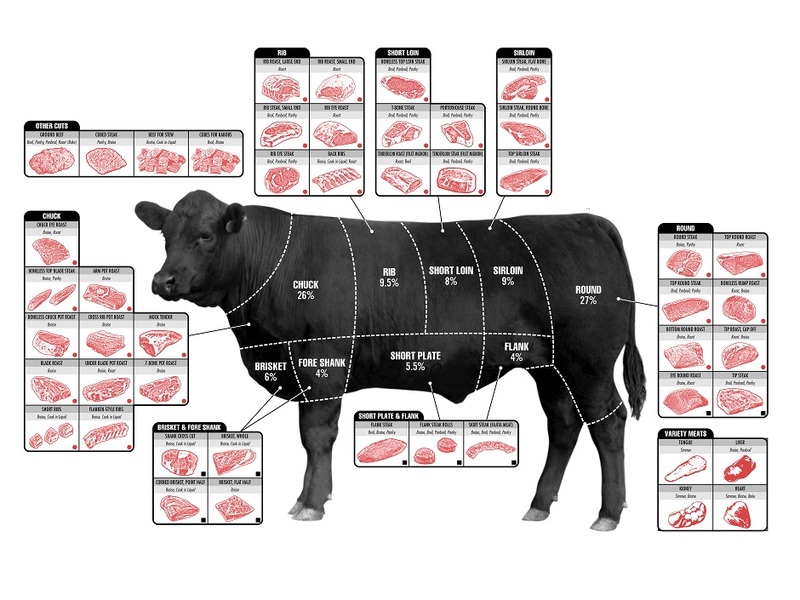 Cuts from the loin and rib are the highest quality for Choice beef. This is the most common grade found in local grocery stores. USDA Select – Select grades of meat are still tender. Because they contain the least amount of marbling, they are not as juicy as the above-mentioned grades. Select is more lean than Prime and Choice, marinating this cut will help to ensure tenderness. Standard – Standard grades of meat are often packaged as “store brand”. This cut has little marbling and is not labeled by the USDA. Commercial/Utility/Cutter/Canner – These grades of meat are the lowest grade. They are often used for cheap qualities of ground beef, hot dogs, and other low quality meats. At Zeffert and Gold we are proud to use the highest quality meats and seafood available for our clients! Error: Error validating access token: Session has expired on Friday, 12-Apr-19 20:42:14 PDT. The current time is Thursday, 18-Apr-19 05:39:26 PDT.